The new research found that garlic oil can prevent cardio myopathy, and can help prevent heart disease. Cardiomyopathy is a type of heart disease is responsible for the deaths due to diabetes. The study was published in the Journal of Agricultural and Food Chemistry, "as quoted from Natural News. Previous studies have shown garlic supports cardiovascular health. However, new research reveals in particular how the plant tubers help diabetics with cardiomyopathy. Wei-Wen Kuo and colleagues at the university fed diabetic rats with corn oil and garlic oil. They observed that rodent health condition in connection with the two treatments. They found that garlic increase antioxidant enzyme, reducing heart inflammation and stop the death of cells. Also preserve the integrity of cardiac tissue is very important. 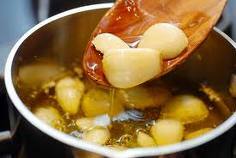 "Garlic oil has the potential to keep the heart from diabetes causes of cardiomyopathy," the researchers said. They assert more than 20 compounds in garlic oil treatment benefits, including allicin, an organosulfur compound. Actually the way to be free from cancer is tricky and easy, because of the way to do does not require any special way, or that hard to find or use. Difficult, because to do so requires a strong determination in order to live healthy. The trick was already known to many people and has been known for long. But now it's time to give more attention to this one. The trick is quitting smoking, eating right and exercise. Only that !!!! Source: Journal of Cancer Epidemiology. Research in the Journal of Cancer Epidemiology, at 30.000 post-menopausal women, showed that women who have healthy lifestyles, the risk for dying from cancer will drop substantially. By making healthy lifestyle, it can reduce our risk to suffer from all types of cancer, which can lead to death. Exhausted body cause of lack of sleep make insomnia sufferer easily be disturbed. Small things can cause anger because insomnia truly a torture for the sufferer and surroundings. To handle insomnia, needed enough quantity of nutrient intake, magnesium and calcium. Deficiency of magnesium and calcium cause slept like a log. Magnesium works to relaxing muscle, if the muscle cramp or pain. Calcium which is very needed to bone growth also used to relaxing mind. Calcium has calming effect. So, condition of anxiousness and stress can be reduce with magnesium and calcium. Melatonin hormone used to make your sleep more comfortable. Now, there are lot of products combining magnesium, calcium and melatonin. Vitamin B complex can also helps insomnia sufferer to be relax. Daily diet should be watched too. Consuming complex carbohydrate such as bread, crackers, or bagel can help you sleep. The opposite of complex carbohydrate is sugar. Why complex carbohydrate so useful? It because this substance can stimulate the releasing of serotonin, a brain neurotransmitter that stimulate the feeling of sleepy. A glass of milk and honey can also be the sure cure to make your sleep more sound sleep. Milk contains lots of amino acid tryptophan which can help the releasing of serotin and melatonin hormone. Triptophan Supplement has not been permitted in US because this product ever cause serious blood disorder. But, there’s no risk for them who want consume foods that contain triptophan such as milk or turkey to reduce insomnia. People who had trouble with sleep was suggested to consume at night. Lettuce contains substance related to opium which accelerate the feeling of sleep and lettuce also contains hyoscyarnin which works as anti-cramps. Better if the dinner menu also involve beans and fish meat or chicken meat. Those foods rich in niacin (vitamin B3) which help to produce serotonin. Foods that should be avoided are spiced food, caffeine, alcohol, carbohydrate (sugar, syrup), preservatived food, and canned food. Sugar and syrup increase sugar blood level and producing energy which can be annoying you to sleep. High protein food such as beef can inhibit the production of serotonin and make you awake continuously. Monosodium glutamate (MSG) should be avoided too cause occurring stimulant reaction. Avoiding eating cheese, chocolate, spinach and tomato before sleep also recommended. All those food contain tyramin which stimulate norepinephrine, make your brain also awake.